So began my guide Michael on my Le Cool Dublin walking tour. I’ve been to Dublin before, but this was different. 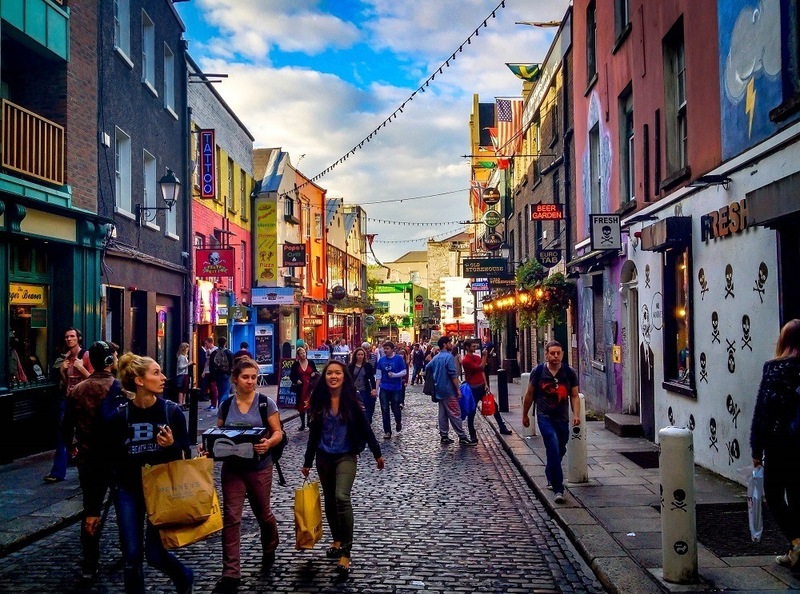 From the first moment, it was clearly not a conventional tour of a European capital city, especially in a city like Dublin that is bursting at the seams with history. Le Cool is a weekly magazine in Dublin that focuses on a snapshot of what’s “cool and now” in the city, and so do its eponymous tours. So cool and now, in fact, that you don’t find out the actual starting location of the tour until the day before. My tour began at the Central Bank of Ireland in the middle of downtown Dublin when a variety of Dubliners and a few travel bloggers gathered on a beautiful Saturday morning for a tour of… well, we weren’t exactly sure. That’s because the stops along the way aren’t announced until you actually get to them. And in reality, a bit of it is sorted out along the way. This is the beauty of Le Cool. For an uber-type A person like me who carefully weighs how I spend time when traveling, it was a bit of a challenge to let go and take in whatever we were going to see, but it turned out to be a lot of fun. Our first stop was the graphic design studio of WorkGroup. 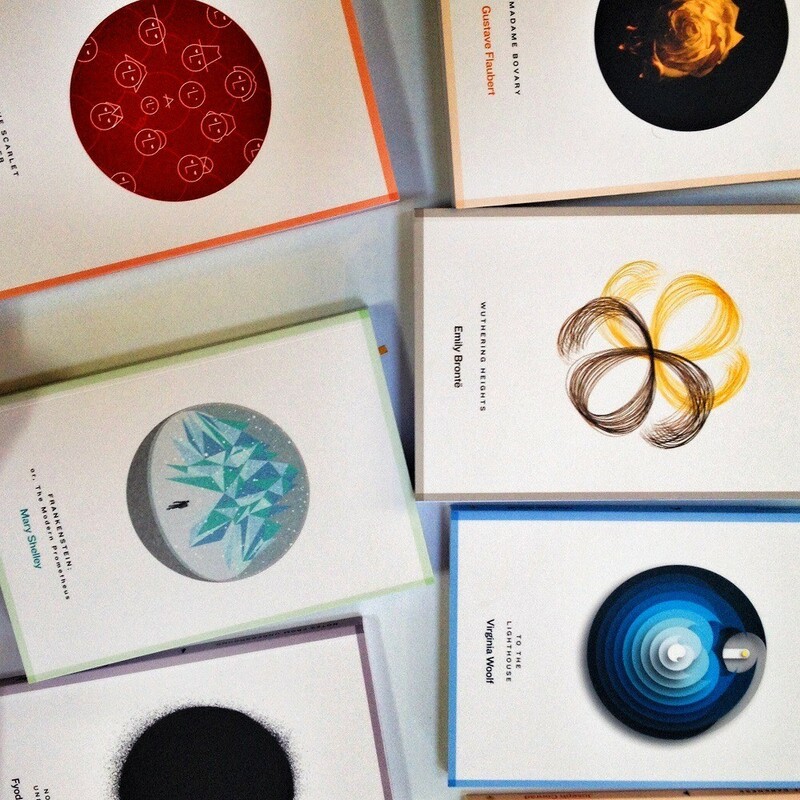 These guys design a wide variety of creative assets from product logos and labels (beer!) 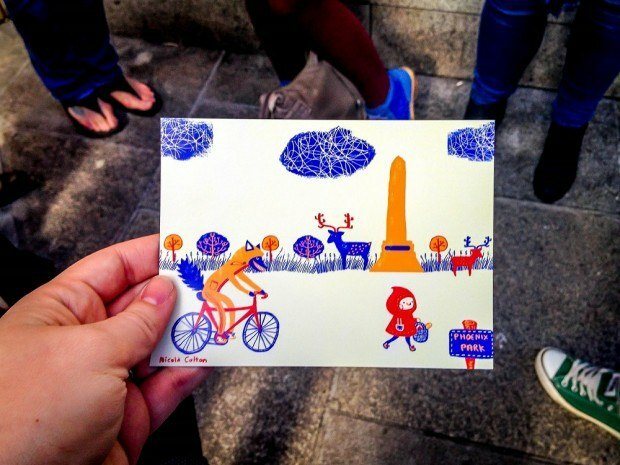 to artistic maps of Dublin. David gave us insight into their creative process and how they work with clients to arrive at their final product. Their work–modern design that never feels like it’s trying too hard–has been applied to everything from classic books to iPhone apps. Our group headed further into Temple Bar, stopping to meet illustrator Nicola Colton (literally on the street corner on the way to an appointment), where she showed us her new project, “A Fairytale in Dublin.” In her artwork, Nicola marries traditional fairytales with the sites of Dublin, depicting all kinds of stories like trolls on the Ha’penny Bridge and Little Red Riding Hood in Phoenix Park. Her cartoon illustrations inspired by children’s books are inventive, playful and quirky in the best of all possible ways. 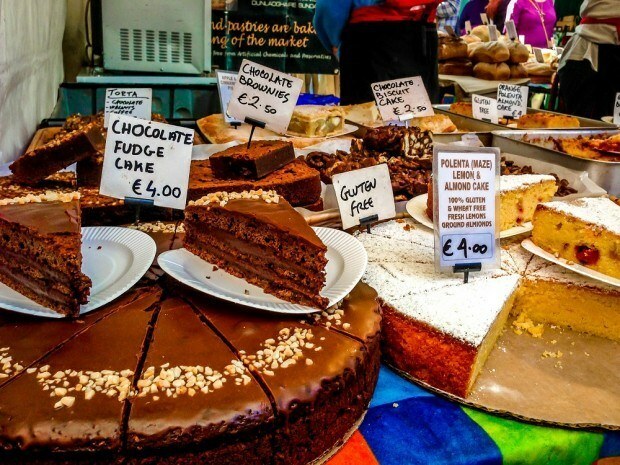 The next stop was a delicious half-hour or so at the Temple Bar food market. Food markets are one of my absolute most favorite things when we travel, and the Temple Bar market was a great example of why. The stalls were full of a wide variety of high quality foods including tacos, Irish cider, fresh fruits and vegetables, amazing scones and pastries, and a sit-down spot for oysters. The market is compact, but since I love to wander and lose myself in the daily-ness of places like this, I could have spent quite a bit more time. One more great thing about this market: the people who run it are so smart that they have installed retractable canopies to combat the typical Dublin rain. Near the market, we stopped several times to look at some of the plentiful street art in the area before heading on to the Ha’Penny Flea Market for clothes, records, jewelry and the standard flea market fare. 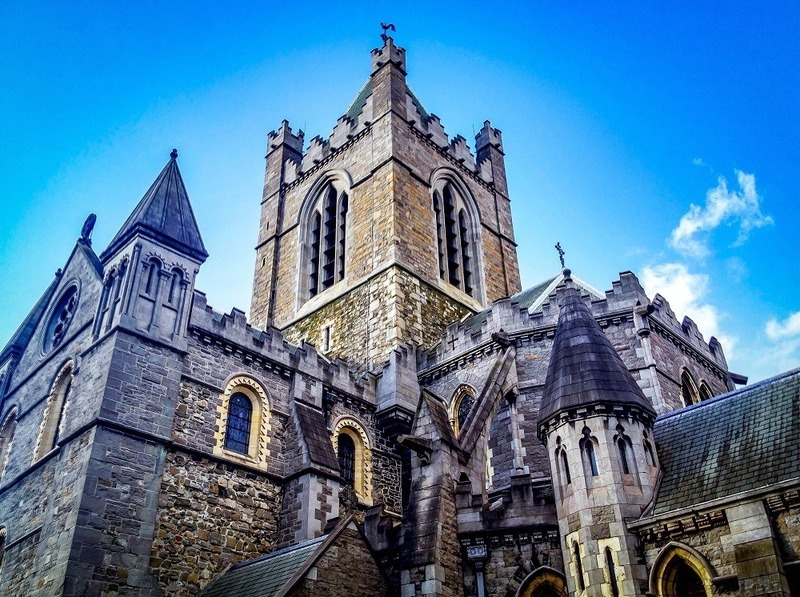 The best thing about the Le Cool Dublin tour was the feeling of experiencing aspects of the city that I wouldn’t otherwise have found or had access to as a typical tourist. It was definitely worth sacrificing my need to plan for the spontaneity of the tour. I had the opportunity to join in on an informative Pat Liddy Walking Tour of Dublin, which includes many of the historic highlights of downtown Dublin. Pat and his team are much more knowledgeable than I am, so rather than bore you with the facts I learned, here are a couple of photos from our tour. If you’re visiting Dublin, don’t hesitate to book Dublin walking tours with Pat Liddy or Le Cool Dublin. 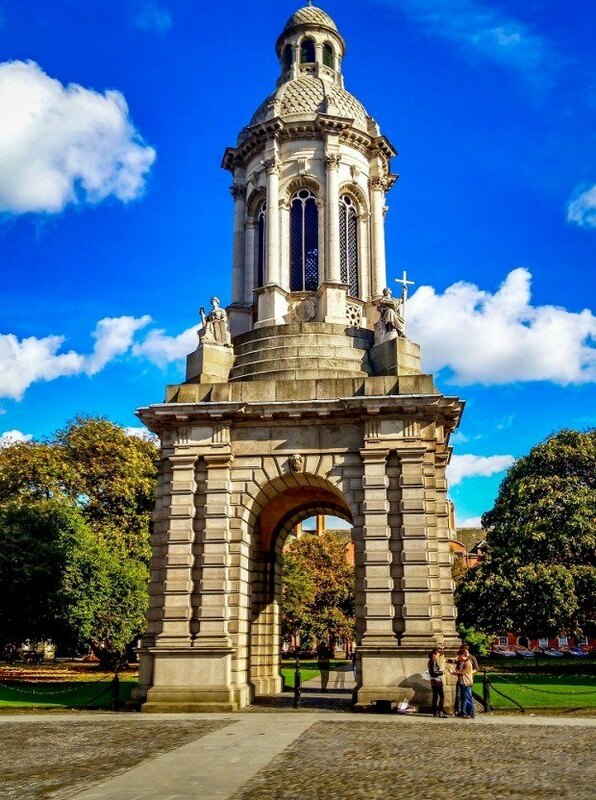 Have you been to Dublin? What was your favorite sight? 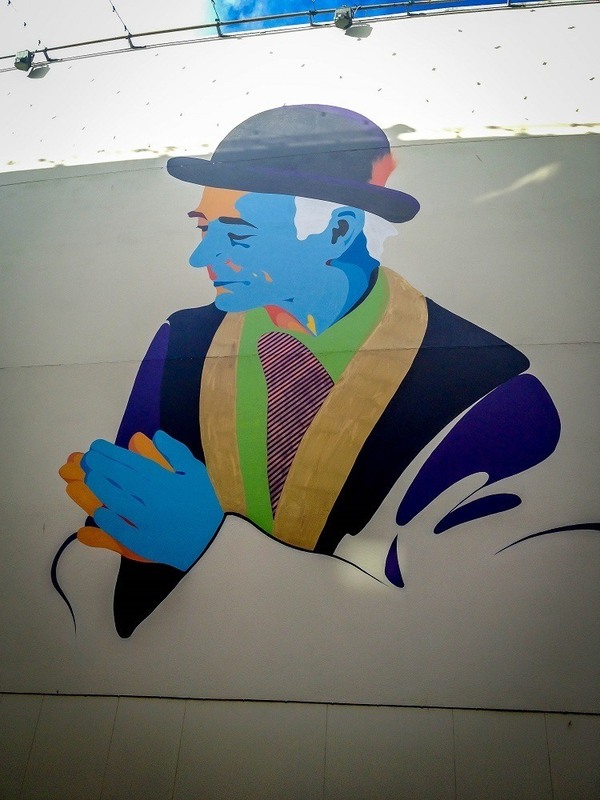 I was a guest of Le Cool Dublin and Pat Liddy’s Walking Tours of Dublin. All opinions of the unusual and tasty are my own. 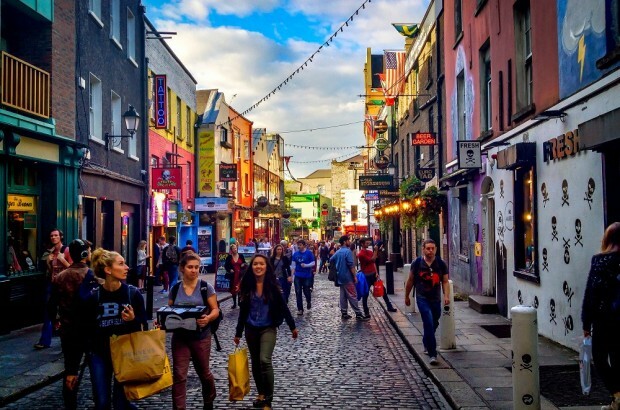 What do you think about An Unexpected Dublin Walking Tour? Beautiful photos! I didn’t get to see enough of Dublin, must go back again soon. I miss Ireland! Loved Dublin, great photos, it looks like it was an awesome tour!